Gramercy Park is a small, fenced-in private park in the borough of Manhattan in New York City. The park is at the core of both the neighborhood referred to as either Gramercy or Gramercy Park and the Gramercy Park Historic District. The approximately 2 acre (0.8 hectare) park is the only private park in New York City, and one of only two in the state; only people residing around the park who pay an annual fee have a key, and the public is not generally allowed in – although the sidewalks of the streets around the park are a popular jogging, strolling and dog-walking route. Gramercy Park itself is located between East 20th Street, called Gramercy Park South at the park, and East 21st Street called Gramercy Park North, and between Gramercy Park West and Gramercy Park East, two mid-block streets which lie between Park Avenue South and Third Avenue. Irving Place commences at the southern end of Gramercy Park, running to 14th Street, and Lexington Avenue, a major north-south thoroughfare on the East Side of Manhattan, terminates at the northern end. The neighborhood's boundaries are roughly 14th Street to the south, First Avenue to the east, 23rd Street to the north, and Park Avenue South to the west. To the west is the Flatiron District, with Union Square to the southwest, to the south is the East Village, to the east are Stuyvesant Town and Peter Cooper Village, and to the north are Rose Hill on the northwest and Kips Bay on the northeast. The area which is now Gramercy Park was once in the middle of a swamp. In 1831 Samuel B. Ruggles, a developer and advocate of open space, proposed the idea for the park due to the northward growth of Manhattan. He bought the property, which was then a farm called "Gramercy Farm", from James Duane, son of Mayor James Duane (for whom the city's Duane Street is named), father of James Chatham Duane, and a descendant of Peter Stuyvesant. To develop the property, Ruggles spent $180,000 to landscape it, draining the swamp and causing about a million horsecart loads of earth to be moved. As part of his overall plan for the square, Ruggles also brought about the creation by the state legislature of Lexington Avenue and Irving Place, two new north-south roads laid out between Third and Fourth Avenues and feeding into his development at the top and bottom of the park. The new streets reduced the number of lots around the park from 66 to 60. 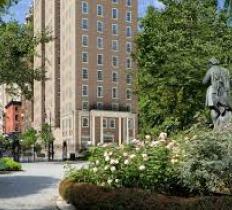 Whether the neighborhood is called "Gramercy Park" or "Gramercy," it is generally considered to be a quiet and safe area. While real estate in Manhattan is rarely stable, the apartments in the neighborhood around Gramercy Park have experienced little turmoil. East 19th Street between Third Avenue and Irving has been called "Block Beautiful" for its wide array of architecture and pristine aesthetic. Townhouses with generous backyards and smaller apartments alike coincide in a collage of architecture in Gramercy Park.